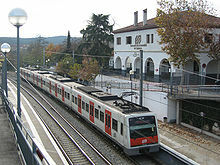 The Barcelona–Vallès Line (Catalan: Línia Barcelona-Vallès) is an unconnected standard gauge railway line linking Barcelona with Sabadell and Terrassa via the Collserola mountain range, in Catalonia, Spain. Its name refers to the Catalan historical region of Vallès, whereby most part of the line runs. Plaça de Catalunya station serves as the Barcelona terminus of the line, where almost all its trains either start or terminate. The line then continues northwards and branches off twice before leaving the city limits. Its main route splits in two in Sant Cugat del Vallès, forming two major branches to Sabadell and Terrassa. It has 40 passenger stations in operation and a total line length of 48.1 kilometres (29.9 mi). The origins of the line date from 1863, when a privately owned railway from Barcelona to the then-separated town of Sarrià was opened. In 1912, Catalan engineer Carles Emili Montañès created the company Ferrocarriles de Cataluña (FCC) in order to take control of the line and extend it northwards. After successive extensions, the line reached Terrassa and Sabadell in 1919 and 1922, respectively. In 1977, FCC announced that the whole line was to be closed due to the company's bad economic results. Nevertheless, the Spanish government prevented that from happening by taking control of it. The line was transferred to the Catalan government in 1979, and has been operated by Ferrocarrils de la Generalitat de Catalunya (FGC) ever since. Currently, the most prominent intervention on the line is the extension of the Terrassa and Sabadell branches through the construction of a route underneath the two cities; the former was completed in 2015, whilst the latter did so in 2017. Barcelona Metro rapid transit lines 6, 7 and 12 serve the line's urban branches within Barcelona, while the rest of the line is operated as a high-frequency commuter rail system known as Vallès Metro (Catalan: Metro del Vallès). This system further includes the Vallvidrera Funicular, which is also operated by FGC. The Barcelona–Vallès Line is part of the Autoritat del Transport Metropolità (ATM) fare-integrated public transport system for the Barcelona metropolitan area. Terrassa Metro is the name of the current subway in Terrassa, Catalonia, Spain, operated by the Catalan government-owned rail company Ferrocarrils de la Generalitat de Catalunya (FGC). It could be more accurately defined as an underground addition to the already existing FGC commuter train network in the city, located in the metropolitan area of Barcelona. Construction of the subway line was due to start in 2008 and the date of completion was estimated to be in 2010. The proposed line will link the already existing FGC station Terrassa - Rambla with the Renfe rail line in the city, and will cover a larger portion of the city area, including the Polytechnic University of Catalonia schools located in Terrassa. Construction of the tunnel in Can Roca started in April 2007. Generalitat de Catalunya stated a budget of 178.8 million euros will be available for the construction of the Terrassa Metro, which will be made up of an addition to the Terrassa train stations belonging to the FGC line S1. FGC and Renfe budgets combined sum will sum 321 million euros. Renfe itself is going to build another station in the city: Terrassa Est - Passeig del Camp Parts of the Vallès line operated by FGC are actually already known under the collective name of Metro del Vallès, which will include the Terrassa service and the extension of S2 which will become Sabadell Metro in the almost adjacent municipality of Sabadell, which is already under construction. The Barcelona–Vallès Line has its start point at Plaça de Catalunya station, which is located directly underneath El Triangle shopping mall, on the southwesternmost side of Plaça de Catalunya ("Catalonia Square"), a major public transport hub in the Barcelona district of Eixample. The line then continues northwestwards in an underground route along Balmes Street until its intersection with Diagonal Avenue, from this point on running underneath Via Augusta. After Gràcia station, the line branches off thanks to a flying junction, forming a 1.9-kilometre-long (1.2 mi) stretch to Avinguda Tibidabo station. Contrarily to the line's main route, this branch line keeps on running northwestwards, following again Balmes Street up to its northern end, which is also the northern terminus of the branch line. The main line towards Vallès bends westwards exactly following Via Augusta on its way along the Sarrià-Sant Gervasi district. It branches off again at Sarrià station, forming a 0.6-kilometre-long (0.37 mi) stretch to Reina Elisenda station. The main route, however, continues northwards in a backwards C-shaped route through Barcelona's last streets at the foot of the Collserola mountain range. At this point, the line runs on a succession of alternated open-cut and underground sections before eventually crossing the Vallvidrera neighborhood through a 1.6-kilometre-long (0.99 mi) tunnel in a northwest direction. It then continues going across Collserola's central area above ground, running parallel to C-16 motorway up to Valldoreix station in Sant Cugat del Vallès, passing through Les Planes and La Floresta neighborhoods. Next, the line curves northeasterly, getting closer to Sant Cugat del Vallès city center. It diverges into two main branch lines immediately after Sant Cugat station: the Terrassa branch curves markedly in a west direction, while the Sabadell branch runs northwards. On the one hand, the stretch to Terrassa continues moving away from Sant Cugat del Vallès in a northwesterly direction towards Rubí, where the line's operations center is located. It goes along the western limits of Rubí city center, describing a straight route northwards to the Les Fonts neighborhood. The branch line proceeds by slightly curving northwesterly, and penetrates into Terrassa city center through a route underneath Rambla del Pare Alegre and Rambla d'Égara streets. After Terrassa Rambla station, it runs in a S-shaped route, reaching Vallparadís Park, then continuing northwards, terminating at Terrassa Nacions Unides station. On the other hand, the stretch to Sabadell curves northeasterly as it approaches the end of its route through Sant Cugat del Vallès. It then passes through Cerdanyola del Vallès's Bellaterra neighborhood before curving notably in a southwest direction and, shortly after, again in a northeast direction, reaching the Bellaterra campus of the Autonomous University of Barcelona. Before curving northwesterly, the branch line crosses a part of the campus thanks to a short tunnel and, about 700 metres (2,300 ft) further, it goes through another short tunnel as it bends west. It curves in a north direction towards Sant Quirze del Vallès immediately after. The line then enters Sabadell in a northeast direction, continuing above ground up to Sabadell Estació station; hereafter, running in an underground route terminating at Sabadell Rambla station. Entrance to Rubí Operations Center. The line accounts for a total length of 48.1 kilometres (29.9 mi) and is entirely electrified at 1,500 volts direct current (DC) using overhead lines. It is grade-separated in its whole length, running completely underground in central Barcelona, Terrassa and Sabadell. Excepting for the single-track section between Sabadell Estació and Sabadell Rambla stations, the rest of the line has double track. Besides, an additional 4.4-kilometre-long (2.7 mi) line section belonging to the extension of the Sabadell branch is currently under construction. Once completed, it will allow for the dismantling of the line's only remaining single-track section. The signaling and security systems used on the line are centralized traffic control (CTC) and automatic train protection (ATP). The line features standard gauge (1,435 mm (4 ft 8 1⁄2 in)), unlike Spain's conventional mainline railway system, which features the broader Iberian gauge (1,668 mm (5 ft 5 21⁄32 in)), and to which it is unconnected. A total of 34 railway stations are situated along the line, all of which are disabled-accessible, with the exception of El Putxet, Sarrià and Peu del Funicular stations. 19 out of 34 stations are underground, while the rest are at-grade, and 6 out of 34 are transfer stations. The opening of the extension of the Sabadell branch will suppose the incorporation of 5 new underground stations, one of which will be a transfer station to the Rodalies de Catalunya commuter and regional rail system. The line's operation is centralized at Rubí Operations Center, a rail complex run by Ferrocarrils de la Generalitat de Catalunya (FGC) located south of Rubí station. It contains a repair shop and a depot for the rolling stock as well as the Integrated Control Center (ICC), which includes the CTC center and further serves the Llobregat–Anoia Line. The ICC is also in charge of supervising and regulating the facilities found in the line's stations such as elevators, escalators and ticket vending machines, among other functions. Together with the rest of the Terrassa branch extension project, a small 220-metre-long (720 ft) depot located at the end of the branch line was opened in July 2015. It is known as Can Roca Depot and has a maximum capacity of 8 four-car trains. Before being dismantled in November 2004, there had existed a depot and a repair shop near Barcelona's Sarrià station. In July 2017, an additional major depot was opened north of Sabadell Parc del Nord station as part of the Sabadell branch extension project. Several rapid transit and commuter rail services run on the Barcelona–Vallès Line, all of them either starting or terminating at Plaça de Catalunya station in central Barcelona (excepting the L12 shuttle services). All rail services call at Barcelona's Provença, the second-busiest station on the line after Pl. Catalunya. The first trains run about 4:30 in the morning to midnight, with later starting times on weekends. Currently, there are no overnight services, though the last trains run just after 2:00 the following morning on Friday and Saturday nights as well as on public holidays. Continuous overnight rapid transit services had previously been offered on Saturdays, though they were suspended to reduce operational costs in January 2012. Rapid transit services run only on the two urban branch lines within the city of Barcelona and are considered part of the Barcelona Metro system, so that they are numbered and colored consistent with the rest of the system's lines—all Barcelona Metro lines are designated with the letter "L" plus a number, and each is colored distinctly on maps. The services running between Plaça Catalunya and Sarrià are designated L6 and colored deep lavender, the shuttle trains between Sarrià and Reina Elisenda are designated L12 and colored pale lavender, whilst the services running on the Avinguda Tibidabo branch are designated L7 and colored brown. The L7 is also often referred to as Balmes Line (Catalan: Línia de Balmes). Before 6 November 2003 (2003-11-06), L6 and L7 services were designated U6 and U7, respectively, with the letter "U" standing for "urban", and were not considered part of the Barcelona Metro. Commuter rail services run between Barcelona and other locations in the Vallès area, and are known under the collective name of Vallès Metro (Catalan: Metro del Vallès). They are designated with the letter "S", which stands for "suburban", plus a number, and have limited stops along their routes. End-to-end services to Terrassa and Sabadell are designated S1 and S2, respectively, and run continuously all-year-around. During rush hours, additional partial services run between Barcelona and other stations in the Vallès area in each direction, operating as skip-stop clones of S1 and S2 services. The partial services running on the Terrassa branch are designated S5, while the ones on the Sabadell branch are designated S55. During school time, some trains include two of their cars reserved for students. Furthermore, in addition to regular commuter rail services, one train entirely reserved for students is operated in each direction on weekdays. The current line scheme allows for peak-time service frequencies of less than 6 minutes in each direction on the Av. Tibidabo, Terrassa and Sabadell branches, and 4 minutes on the Reina Elisenda branch. The overall service frequency reduces as the line gets closer to central Barcelona, where the core route between Pl. Catalunya and Gràcia stations provides a headway of less than 2 minutes in each direction during rush hours. Thus, with up to 32 trains per hour in each direction, the Pl. Catalunya–Gràcia section of the Barcelona–Vallès Line is one of Europe's busiest commuter rail lines by number of operations together with RER line A in Paris or portions of the Berlin S-Bahn. Barcelona Pl. Catalunya Sarrià 8 — 6′ 8′ 15′ 12′ During the morning rush hour, the L6 does not operate; S5 and S55 services cover the same route. During the afternoon rush hour, L6 services are alternated with S5 and S55 services. Barcelona Pl. Catalunya Terrassa Nacions Unides 19 10′ 12′ 15′ 20′ 41′ S1 and S2 trains call at all stations along their routes excepting Sant Gervasi, La Bonanova and Les Tres Torres stations. Sant Cugat 11 12′ — 25′ S5 and S55 trains call at all stations along their routes excepting Peu del Funicular, Baixador de Vallvidrera and Les Planes stations. Interior of a 112 Series train. The trains on the Barcelona–Vallès Line are currently the 112, 113 and 114 Series. There are a total of 66 electrical multiple units, all of which are disabled-accessible, air-conditioned and equipped with the automatic train protection (ATP) security system. The trains are technically very similar, though the 112 Series are notably different than the 113 and 114 Series in their design. They all feature the colors of the Ferrocarrils de la Generalitat de Catalunya (FGC) logo—white and orange. An initial 16-unit set of 112 Series trains started operating on the line between 1995 and 1996, and another 6-unit set did so in 2003. Considering both their technical features and design, the 112 Series are almost identical to the 213 Series that run on the Llobregat–Anoia Line. The latter, however, feature 1,000 mm (3 ft 3 3⁄8 in) metre gauge and consist of three cars, while the 112 Series feature 1,435 mm (4 ft 8 1⁄2 in) standard gauge and consist of four cars. The entry into service of the first set of 112 Series trains allowed for the implementation of the current Vallès Metro high-frequency line scheme as well as the removal of the former three-car 400 Series in 1996. Together with the Brill 10–27, Brill 301–312 and 600 Series units, the 400 Series were originally operated by Ferrocarriles de Cataluña (FCC) and one unit of each series is preserved as part of FGC's historical rolling stock. The 112 Series is used on services on the Terrassa, Sabadell and Reina Elisenda branches. Before the entry into service of the 113 and 114 Series throughout 2014, a former 20-unit set of the three-car 111 Series trains had run on the line. These trains started operating between 1983 and 1987, and were the line's first modern electrical multiple units. From January 2014 on, a 19-unit set of the four-car 113 Series trains progressively started operating on the Sabadell, Terrassa and Reina Elisenda branches together with the 112 Series. In December of the same year, a 5-unit set of the three-car 114 Series trains started operating on the Avinguda Tibidabo branch, whose station platforms are too short to hold four-car trains such as the 112 and 113 Series. The 113 and 114 Series are identical in both their technical features and design, though they differ in the number of cars and present some modifications on the seat layout. After the arrival of the 113 and 114 Series, 111 Series trains were removed from circulation and dismantled. Yet, one unit has been preserved as part of FGC's historical rolling stock. In December 2017, FGC ordered 15 new four-car EMUs, designated the 115 Series, from Stadler Rail's ex-MACOSA facility with entry into service planned for 2019. All the stations on the Barcelona–Vallès Line feature a characteristic rhombus-shaped nameplate. This one belongs to Sant Cugat station. The following table lists the name of each station on the Barcelona–Vallès Line in order from south to north; a photo of the current station; the rail services operating at the station—L6, L7, L12, S1, S2, S5, S6 and S7—; if applicable, the date the current station was opened; the municipality or the city district (in the case of Barcelona) in which each station is or will be located; the fare zone each station belongs or will belong to according to the Autoritat del Transport Metropolità (ATM) fare-integrated public transport system; remarkable notes about the station, including clarifications, additional information and a location map; and usage figures. A subway, named Sabadell Metro (Catalan and Spanish: Metro de Sabadell), is planned for Sabadell. It will be operated by the Catalan government-owned rail company Ferrocarrils de la Generalitat de Catalunya. Construction of the subway line started in late 2006 and was due to be finished by 2011 or 2012, depending on which project the FGC finally decided on. However, in January 2012, work was halted due to the Spanish economic crisis. The proposed line will join the city centre of Sabadell with its northern neighbourhoods, where it will join the Renfe network line, and will effectively link the city with Barcelona through the main FGC lines. The terminus of the current general FGC line, a station called Sabadell - Rambla, will disappear as it will be replaced by this network. The original project, if fulfilled, will be 4.2 km long. It has been criticised for devising a subway line that would run nearly parallel to the Renfe line, which has been deemed not effective enough to suit the needs of a city the size of Sabadell. Also, a civic association called Sabadell Cruïlla has proposed the construction of a larger metro system to link Sabadell with other large cities in the immediate region such as Terrassa and Granollers. In addition to that, it has proposed several changes to the initial project so the subway line would reach Torreromeu and Polinyà. ^ Note that figures for the Vallvidrera Funicular are included as well. ^ All usage figures (entry only) are in millions per year for 2013. ^ a b "Entra en servei el perllongament d'FGC a Terrassa" [FGC's Terrassa extension opens for passenger service] (PDF). Sala de premsa (Press release) (in Catalan). Department of Public Works and Transport. Government of Catalonia. ; Ferrocarrils de la Generalitat de Catalunya. 29 July 2015. Retrieved 31 July 2015. ^ "President Puigdemont: "El perllongament d'FGC a Sabadell és un compromís insubornable amb el transport públic i la mobilitat sostenible"" [President Puigdemont: "FGC's Sabadell extension is an incorruptible commitment to public transport and sustainable mobility"] (PDF). Sala de premsa (Press release) (in Catalan). Department of Public Works and Transport. Government of Catalonia. 20 July 2017. Retrieved 2 January 2018. ^ Borràs, Bernat. "Gràcia". trenscat.cat (in Catalan). Retrieved 14 September 2014. ^ a b c d Borràs, Bernat. "Línia Barcelona-Vallès - Característiques tècniques" [Barcelona–Vallès Line - Technical features]. trenscat.cat (in Catalan). Retrieved 14 September 2014. ^ a b c d e f g Google (14 September 2014). "Overview map of the Barcelona–Vallès Line and its service routes" (Map). Google Maps. Google. Retrieved 14 September 2014. ^ "El túnel ferroviari d'Horta" [Horta railway tunnel] (in Catalan). Department of Public Works and Transport. Generalitat of Catalonia. Retrieved 14 September 2014. ^ Borràs, Bernat. "Línia Barcelona-Vallès - Perllongament Metro del Vallès a Terrassa" [Barcelona–Vallès Line - Metro del Vallès extension in Terrassa]. trenscat.cat (in Catalan). Retrieved 17 June 2015. ^ Distance measured using Google Maps's "Distance Measurement Tool". ^ a b Borràs, Bernat. "Línia Barcelona-Vallès - Perllongament Metro del Vallès a Sabadell" [Barcelona–Vallès Line - Metro del Vallès extension in Sabadell]. trenscat.cat (in Catalan). Retrieved 17 June 2015. ^ a b "Barcelona–Vallès Line". Ferrocarrils de la Generalitat de Catalunya. Retrieved 17 June 2015. ^ "El Centre de Comandament Integrat de Rubí assumeix el control de la línia Llobregat-Anoia" [The Integrated Control Center in Rubí takes over the control of the Llobregat–Anoia Line] (PDF). Sala de premsa (Press release) (in Catalan). Ferrocarrils de la Generalitat de Catalunya. 5 June 2010. Retrieved 14 September 2014. ^ Borràs, Bernat. "Terrassa Nacions Unides i dipòsit de trens de Can Roca" [Terrassa Nacions Unides and Can Roca Depot]. trenscat.cat (in Catalan). Retrieved 31 July 2015. ^ "Inici dels treballs d'enderrocament dels antics tallers d'FGC a Sarrià" [Start of the dismantling of FGC's former repair shops in Sarrià]. Sala de premsa (Press release) (in Catalan). Generalitat of Catalonia. 26 May 2009. Retrieved 17 June 2015. ^ Borràs, Bernat. "Estació Sabadell-Ca n'Oriac i dipòsit de trens" [Sabadell-Ca n'Oriac station and depot]. trenscat.cat (in Catalan). Retrieved 2 January 2018. ^ a b c "School time schedule of lines S1 and S5" (PDF). Ferrocarrils de la Generalitat de Catalunya. July 2015. Retrieved 15 May 2015. ^ a b c "School time schedule of lines S2 and S55" (PDF). Ferrocarrils de la Generalitat de Catalunya. July 2015. Archived from the original (PDF) on 26 July 2015. Retrieved 15 May 2015. ^ "School time schedule of the lines serving Pl. Catalunya station" (PDF). Ferrocarrils de la Generalitat de Catalunya. March 2015. Retrieved 17 June 2015. ^ "FGC aprova una reorganització del servei per ajustar l'oferta a la demanda i racionalitzar despeses a les línies metropolitanes" [FGC passes a service reorganization to adapt the service supply to the demand as well as to mainstream costs at the metropolitan lines] (PDF). Sala de premsa (Press release) (in Catalan). Ferrocarrils de la Generalitat de Catalunya. 20 December 2011. Retrieved 17 June 2015. ^ a b Borràs, Bernat. "Línia Barcelona-Vallès - Línies" [Barcelona–Vallès Line - Lines]. trenscat.cat (in Catalan). Retrieved 17 June 2015. ^ Borràs, Bernat. "Línia Barcelona-Vallès - Línia L7 Pl. Catalunya - Av. Tibidabo" [Barcelona–Vallès Line - Line L7 Pl. Catalunya - Av. Tibidabo]. trenscat.cat (in Catalan). Retrieved 17 June 2015. ^ "Tres línies de FGC a Barcelona canvien de nomenclatura per adaptar-se a la resta de la xarxa ferroviària" [The designation of three FGC lines in Barcelona is changed to coordinate it with the rest of the railway system] (PDF) (in Catalan). VilaWeb. 30 October 2003. Retrieved 10 May 2015. ^ "El Metro del Vallès i les línies urbanes de Sarrià i avinguda Tibidabo" [The Vallès Metro and the Sarrià and Avinguda Tibidabo urban lines]. Actuacions i obres (in Catalan). Department of Public Works and Transport. Generalitat of Catalonia. Archived from the original on 18 June 2015. Retrieved 17 June 2015. ^ Julià Sort, Jordi (October 2013). Sagrera i la xarxa ferroviària de Barcelona [Sagrera and Barcelona's railway system] (in Catalan). Barcelona: Viena Edicions. p. 143. ISBN 978-84-8330-740-3. ^ "Tren: 112" [Train: 112]. Transporte Barcelona (in Spanish). Retrieved 17 June 2015. ^ a b c d Borràs, Bernat. "Línia Barcelona-Vallès - Trens - Unitats sèrie 112" [Barcelona–Vallès Line - Trains - 112 Series units]. trenscat.cat (in Catalan). Retrieved 17 June 2015. ^ Borràs, Bernat. "Línia Barcelona-Vallès - Trens - Unitats sèrie 113" [Barcelona–Vallès Line - Trains - 113 Series units]. trenscat.cat (in Catalan). Retrieved 17 June 2015. ^ a b Borràs, Bernat. "Línia Barcelona-Vallès - Trens - Unitats sèrie 114" [Barcelona–Vallès Line - Trains - 114 Series units]. trenscat.cat (in Catalan). Retrieved 17 June 2015. ^ Borràs, Bernat. "Trens - Unitats 213" [Trains - 213 units]. trenscat.cat (in Catalan). Retrieved 17 June 2015. ^ Borràs, Bernat. "Línia Barcelona-Vallès - Trens històrics - Brill 18" [Barcelona–Vallès Line - Historical trains - Brill 18]. trenscat.cat (in Catalan). Retrieved 17 June 2015. ^ Borràs, Bernat. "Línia Barcelona-Vallès - Trens històrics - Brill 301" [Barcelona–Vallès Line - Historical trains - Brill 301]. trenscat.cat (in Catalan). Retrieved 17 June 2015. ^ Borràs, Bernat. "Línia Barcelona-Vallès - Trens històrics - Unitat 400 "Granota"" [Barcelona–Vallès Line - Historical trains - 400 Unit "Frog"]. trenscat.cat (in Catalan). Retrieved 17 June 2015. ^ Borràs, Bernat. "Línia Barcelona-Vallès - Trens històrics - Unitat 600 "Perico"" [Barcelona–Vallès Line - Historical trains - 600 Unit "Perico"]. trenscat.cat (in Catalan). Retrieved 17 June 2015. ^ Borràs, Bernat. "Línia Barcelona-Vallès - Trens - Unitats sèrie 111" [Barcelona–Vallès Line - Trains - 111 Series units]. trenscat.cat (in Catalan). Retrieved 17 June 2015. ^ a b "Els nous trens de la sèrie 113 d'FGC comencen a circular pel Metro del Vallès" [The new 113 Series trains start running on the Vallès Metro] (PDF). Sala de premsa (Press release) (in Catalan). Department of Public Works and Transport. Generalitat of Catalonia. ;Ferrocarrils de la Generalitat de Catalunya. 27 January 2014. Retrieved 17 June 2015. ^ a b "La línia L7 d'FGC estrena els nous trens de la sèrie 114" [The new 114 Series trains start running on FGC line L7] (PDF). Sala de premsa (Press release) (in Catalan). Ferrocarrils de la Generalitat de Catalunya. 20 December 2014. Retrieved 17 June 2015. ^ "FGC ven i subhasta per internet material de les unitats de tren de la sèrie 111" [FGC sells and auctions off elements of the 111 Series trains through the Internet] (PDF). Sala de premsa (Press release) (in Catalan). Ferrocarrils de la Generalitat de Catalunya. 20 October 2014. Retrieved 17 June 2015. ^ a b "FGC orders 15 EMUs from Stadler Rail Valencia". International Railway Journal. 10 January 2018. Retrieved 16 March 2018. ^ Integrated Railway Network (PDF) (Map). Autoritat del Transport Metropolità. June 2015. Retrieved 7 November 2015. ^ a b "El DPTOP completa la connexió i millora de les estacions d'FGC de Sant Gervasi i Pl. Molina" [The Department of Public Works and Transport finishes the linkage and improvement of FGC's Sant Gervasi and Pl. Molina stations] (PDF). Sala de premsa (Press release) (in Catalan). Department of Public Works and Transport. Generalitat of Catalonia. 19 April 2010. Retrieved 24 June 2015. ^ "El president Montilla posa en servei la nova estació d'FGC de Volpelleres" [President Montilla opens FGC's new Volpelleres station] (PDF). Sala de premsa (Press release) (in Catalan). Department of Public Works and Transport. Generalitat of Catalonia. ; Tabasa. 5 June 2010. Retrieved 14 September 2014. Salmerón i Bosch, Carles (1988). El Tren del Vallès: Història dels ferrocarrils de Barcelona a Sabadell i Terrassa [The Vallès Train: History of the Barcelona to Sabadell and Terrassa railways]. Els Trens de Catalunya-13B (in Catalan). Terminus. ISBN 84-404-3560-6. Memòria de Ferrocarrils de la Generalitat de Catalunya 2013 [2013 Report of Ferrocarrils de la Generalitat de Catalunya] (PDF) (Report) (in Catalan). Ferrocarrils de la Generalitat de Catalunya; Department of Public Works and Transport. Generalitat of Catalonia. 2014. Retrieved 14 September 2014. Wikimedia Commons has media related to Barcelona–Vallès Line. Barcelona–Vallès Line at Rodalia.info. Real-time status updates of the line by its users via Twitter.